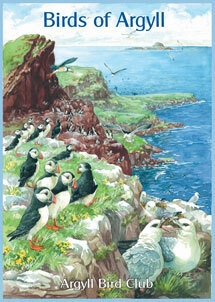 The history, status and distribution of birds in Argyll are described in this new book published in December 2007. This is a landmark publication for the Argyll Bird Club. The only previous avifauna of the region (Harvie-Brown, J. A. & Buckley, T. E. 1892. A Vertebrate Fauna of Argyll and the Inner Hebrides. Edinburgh: David Douglas) was published more than 100 years ago, so an update was well overdue. The core of the book is made up of individual accounts describing the status of the 327 bird species recorded in Argyll to 2006. The species account authors include Tristan ap Rheinallt, Eric Bignal, John Bowler, Roger Broad, Clive Craik, Paul Daw, Mike Gregory, Paul Howarth, Bob Furness, David Jardine, David Merrie, Malcolm Ogilvie, Steve Petty, Michael Thomas, David Wood, all of whom have in-depth knowledge of Argyll’s birds. Margaret Staley and Philip Snow have contributed some first-class black & white drawings, and numerous photographers have provided a wide range of colour images. Edited by ap Rheinallt, T., Craik, J.C.A., Daw, P.C., Furness, R.W., Petty, S.J. & Wood, D. (2007). Published by the Argyll Bird Club, Lochgilphead, Argyll. Hardback, 424 pages in full colour, with numerous maps, photographs and black & white drawings. Measurements: 303 x 213 x 33mm.